PURPOSE Are you ready to give your body a break from all that solid processed food? 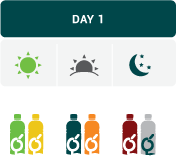 Our 1-Day Juice Cleanse is a gentle program for those of you who are new to juicing. This program replenishes all your vital nutrients with fresh, raw, and unprocessed juices. Cleansing juices are the ideal way to repair, heal and regenerate your body. The best part is, we make them super delicious too! ACTION With this program, you will enjoy a set of 6 bottles in 1 day (5 juices + 1 nut milk). Each bottle is labeled so that you can consume the right juice at the right time (numbers 1 through 6). Note that this program includes juice consumption only during the day without food intake.